In a magnificent combination of art and architecture, Ms. Tobin has incorporated her complex murals into the station’s design. The geometrical patterns and the interaction of subtle and bold colors engage both the mind and the eye. 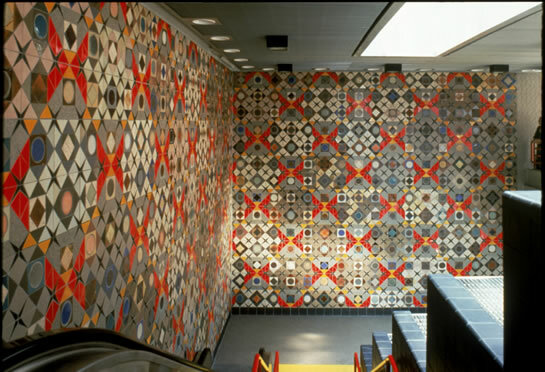 These two murals, constructed from more than 30,000 tiles, can be viewed from the station platform or the train. The artist spent a year in India and was very much influenced by the Islamic tiles found there. The famous Taj Majal in India has tiles with similar design. The design is based on a pattern of very large red X’s and smaller black X’s. For the glaze on some of the tiles, the artist used ash from the Mt. St. Helen volcano eruption. This piece was very tedious to install. It took six weeks, seven days a week to complete. Funded By: The Skillman Foundation, Philip Graham Fund (WDIV and Newsweek), Knight Foundation, City of Detroit, Detroit People Mover Art Commission. 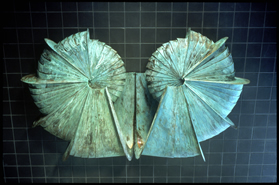 The bronze sculptures with their gracefully curving lines and rich painterly surface, abstractly resemble nature’s organic forms. Each of the six-foot high sculptures incorporates Ms. Osip’s interpretation of nature and her industrial environment.